In the 75 years since its inception, this Tokyo, Japan-based company has become a household name worldwide. Shibaura Engineering Works and Tokyo Electric came together to form Toshiba in 1939. At that time, the firm primarily manufactured devices key to Japan’s modernization, such as telegraph devices and industrial electric machinery. In the decades since, Toshiba has greatly advanced and expanded its offerings. While the corporation is perhaps most well known for its personal digital computers, it also produces phones, televisions, home appliances like microwaves, office equipment, lighting, medical equipment such as MRI machines, elevators, escalators, and more. Given its mastery of many industries, the company’s slogan, “leading innovation,” is quite fitting. The company has estimated revenues over $6.5 billion and more than 200,000 global employees. 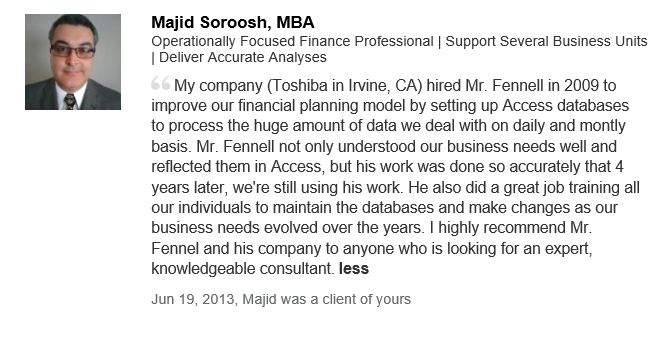 Toshiba’s Irvine, California-based North American Finance office needed to revamp its financial system so that employees in the Accounting and Finance divisions could log into the same program to share files and access relevant information. Before Excel Consultant stepped in, Finance and Accounting were using separate and incompatible (but equally outdated) applications. The senior team of executives (CFO, CEO, SR VP, etc.) would need to view multiple systems in order to view the reports from Accounting and Finance, which was both time consuming and frustrating. Have different levels of document access for employees of various ranks, so that executives could view and edit files, while other administrators could access just the information they needed to fulfill their daily tasks. Allow a non-developer (in this case, the Director of Finance) to alter the system as needed, adjusting to the company’s changing demands. Be reliable, robust, and relatively intuitive, since most of the office’s employees were not particularly proficient in Microsoft Access. Translate information from the SQL Server (Microsoft’s main data platform) and Excel into a uniform format. This project was particularly demanding (and therefore exciting for our team) because Toshiba’s North American Finance office had just two days to complete month-end close or receive an admonishing executive-level call from its headquarters in China. 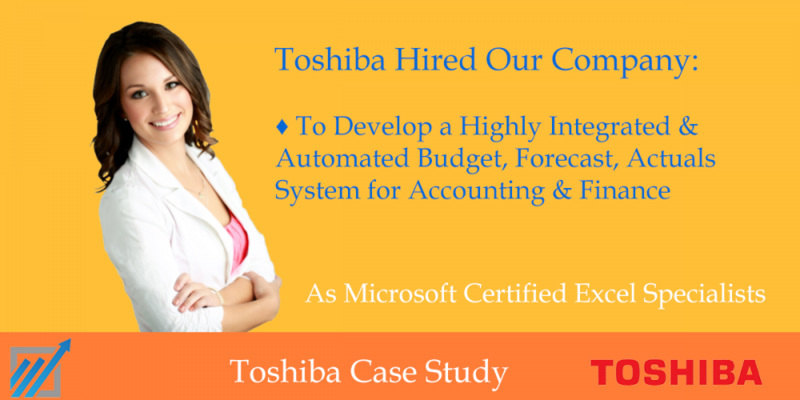 To keep up with these regular, tight deadlines, Toshiba needed a system that was not only faster, but much more accurate. Given the sluggish speeds and major delays associated with its existing system, the team had only been able to meet these targets due to sheer dogged determination. Employees had to run numerous pre-trial closes, making additions and revisions while simultaneously running up to five pre-month closes alongside them. Our mission (which we happily accepted) was to fulfill all of the company’s requests while eliminating this burdensome hassle. Our expert team of instructors, programmers, developers, and consultants completely redesigned the North American Finance office’s system for outstanding outcomes. We created a multifaceted application with diverse functionality—employees could use this new, user-friendly program to write up annual budgets, create project re-forecasts, perform variance analyses, provide executive level summaries, and, of course, complete those pesky month-end close procedures. Our programmers utilized Windows ID to automatically determine each user’s roles and privileges. Based on this information, each user could access the appropriate forms, reports, and data by simply clicking a few dropdown menus, buttons, or tabs. To help ensure that our new database was up to the month-end close task, we also developed the application based on extensive Gray Box assessment, which involves extreme stress testing by users who do not fully understand the internal architecture of the system. This effort paid off. What the previous system took hours to do, our redesigned program finished in mere minutes. To help the Toshiba team further succeed with Microsoft tools, our team trained several key staff members how to use Excel and Access. We even taught them how to automate tasks with macros (keyboard shortcuts in Excel that complete specific procedures) and VBA (Visual Basic for Application) scripts (fundamental programming commands that can automate processes). 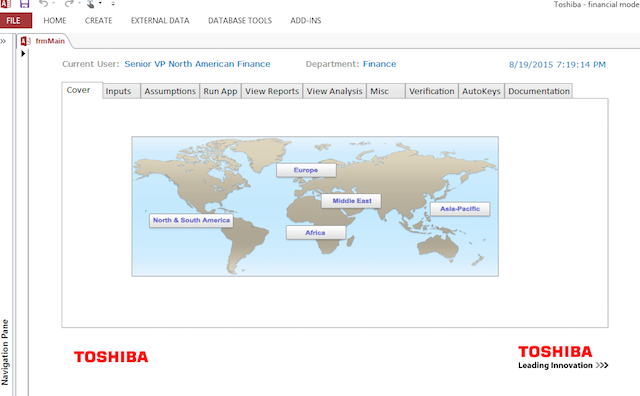 We completed this project in 2009, and Toshiba continues to utilize it on a daily basis. One of the executives involved commented: “[Excel Consultant] not only understood our business needs well and reflected them in Access, but the work was done so accurately that years later, we’re still using the system. The team also did a great job training our individuals to maintain the database and make changes as our business evolved over the years.” At Excel Consultant, we strive to both enhance your programs and educate your staff so that your business can continue to thrive long term.